I have good news that the weather will be beautiful the day of the event with highs in the mid 70’s. We have an important update regarding the Silverado Trail, the trail that drops you down to Aid Station #1. Attached are pictures of the pipe fencing placed about 800 +- feet from the bottom of the trail that is completely across the trail in two different locations. 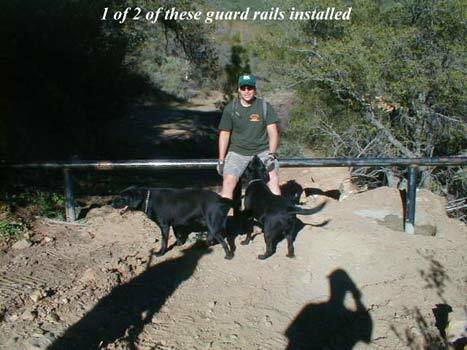 The fencing was placed to prevent motorcycles and 4×4 vehicles from accessing the trail. Please control your speed at the bottom of the trail to stop in time before these barriers. There are also two washouts on the trail within the last 1/2 mile of the trail so be cautious of these also. Our club members where up on the trail working on lowering the water bars which were built a little too high. Another thing to remember is about 1/2 mile from the top of the Silverado Trail there is a sign that states “Silverado Trail” with a red arrow pointing in what seems to be the opposite direction of the trail. This sign is not incorrect, the trail drops down and boomerangs back to the rest of the trail avoiding a technical section that was dug up to prevent off road access. The rest of the course is in excellent shape! 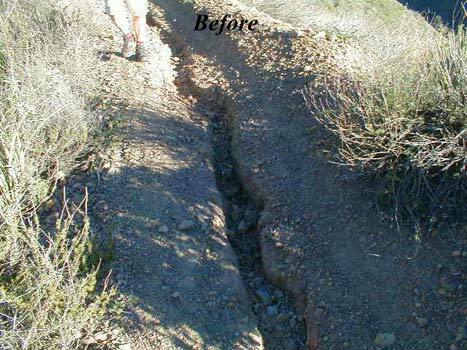 Some of the attached pictures show our club members working on the Silverado Trail to repair the rain ruts. To save everyone time we are encouraging everyone to pick up their race packets at Switchback Cyclery starting this Saturday, February 23rd to Friday, February 29th to receive your number plate and event t-shirt. Switchback is open on Sunday 11-5, Saturday 9-5 and 9-7 during the week. This would save all of us tons of time the morning of the event. You can have a friend pick up your race packet for you. Those not picking up their race packets at Switchback Cyclery must arrive at 4:45 a.m. at the start to pick up your number plate. Those who pre-register at Switchback must arrive by 5:15 a.m. to check in. We’ll have water, cytomax, bananas, oranges and Clif Bars at Aid Station #1. You can have your personal supplies for both Aid Station #1 and #2 delivered to the start. The bags must be marked with what aid station they will be delivered to and your name. We ask that nothing of value be in the bags aside from water and food as we cannot guarantee they will be returned to you. Anything of value will be taken to Switchback Cyclery for pickup after the event. For the first time in what may become an annual event the County of Orange Communications Mobile Command Center is using the event as a drill with the local ham clubs to test their ability to work together in a natural disaster. They will be in direct radio contact with all our ham teams, the Sheriff’s Department, CHP, Forest Service and the Fire Authority. We will have four CHP officers trained as EMT’s supporting the event on dual sport motorcycles and helping with the closure order. They have coordinated notifying the Sheriff of the parking issues at Maple Springs, Holy Jim and at the Finish Line and will be in contact with the County Communication Mobile Command Center to direct medical teams or law enforcement. Here are things your family and friends need to consider if they plan on supporting you. PER THE CLOSURE ORDER NO ONE EXCEPT SUPPORT PERSONNEL/VEHICLES WILL BE ALLOWED BEHIND THE LOCKED GATE AT THE END OF MAPLE SPRINGS. FOREST SERVICE PERSONNEL WILL CITE ANYONE NOT ASSOCIATED WITH EVENT SUPPORT. There is limited parking at the parking lot if you intend to wait there for those participating in the event(s) and if you park illegally or do not have an adventure pass you will be ticketed. The residents will call the Sheriff to ticket you or tow you away if you are parking illegally. Parking is also limited at the second Aid Station. DO NOT PARK IN FRONT OF OR BLOCKING THE FIRE STATION OR THE SHERIFF WILL CITE YOU FOR BLOCKING THE ENTRANCE AND IT IS NOT A CHEAP TICKET. Parking is limited at O’Neill Park so please carpool. We will be running a shuttle from 1:00 p.m. to 5:00 p.m. back to the start at Black Star Canyon Road. Remember that there are no shuttles to the start in the morning. We recommend that you have a family member drop you off and pick you up at O’Neill after the event is over. We expect the awards ceremony to recognize the top 10 to begin between 4:00 and 5:00 P.M. A Raffle will also be held at that time. You must be present to win. Do not leave a car at the finish line as the Sheriffs will ticket you. There is no parking allowed there from dusk to dawn. If you park on Black Star make sure your car is parked well off the pavement to avoid being towed by the Sheriff’s Department. Camping and parking from dusk to dawn is normally not allowed on Black Star Canyon Road but our permit will allow you to park there beginning at 4:00 a.m. but camping overnight is not allowed. The Sheriffs will be patrolling and citing anyone camping on Black Star Canyon Road. Have a whistle and cell phone to aid in your rescue if you are out of sight of rescuers. The whistle will carry further than your voice and a cell phone, while not working on 30 percent of the course, may work where you are injured. We also recommend you buy a compact “space blanket,” an aluminum foil like covering that will keep you warm if you are injured off trail and out of sight. We’ve had problems in the past with participants leaving before the official start time. Support volunteers will be stationed on Black Star Canyon Road starting at 4:30 a.m. to catch anyone attempting to leave early after they check in at the start. You will be DNF’ed if you are caught leaving early. Your number plate must be recorded at all 11 checkpoints or you will not receive a finishing award until the discrepancy is resolved so make sure your number is recorded. The opening ceremonies will start at 5:15 a.m. and the start at 5:30 a.m. ON TIME. Only those on bikes who are entered in the event will be allowed in the start area. We will be checking off number plates and asking for your name to prevent anyone from being in the start area. Anyone not entered in the event is subject to arrest if they enter the closure area. Because we will start in the dark we suggest you purchase a cheap LED light to put on your helmet. The sun will rise at around 6 a.m. so you only need the light for the first 60 minutes. Last year many participants basically tried to “poach” other participant’s “beams of light,” riding really aggressively trying to stay close enough to them to see off their light. Please bring an LED Light or stay at the back of the pack. If you don’t bring a light, don’t cause a crash because you are riding 3 inches from another participant trying to see by their light, instead of carrying your own. You must get supplies from the Aid Stations. If any support personnel on the course has to give you food or water you will be penalized 20 minutes on your time. Just to be safe and to deal with any mud on the course we suggest you spray “Pam” non-stick cooking spray or silicone on your bike (except for on your disc or caliper brakes) to keep mud from sticking to it and take a brush with you. You are starting early and you must begin to eat as soon as you wake up, at least 300 to 500 calories an hour from that point depending on your metabolism. Hydration is also important; remember to include sodium and potassium in your water mix. Eat a decent meal the night before and do not eat or drink anything radically changed from what you have used during training. This is especially true of fluid replacement products. 1. The first climb, Black Star Canyon Road, has one major washout close to the top. We will widen the path around it but it will still be narrow. Take your time when crossing it. The course as a whole is in the best shape it’s been in years and temps are supposed to warm up. 2. The Silverado Trail has a lot of loose rock and two very big washouts and water bars on the last 1/4 mile near the bottom of the trail. 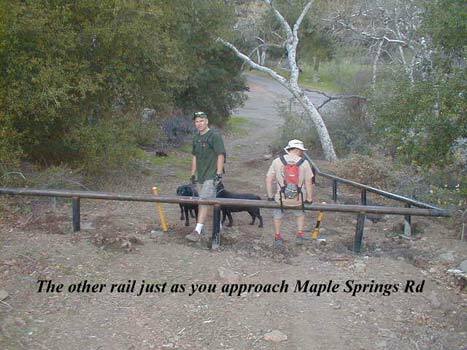 In addition, beginning about 800 +- feet from the bottom of the trail are two areas where pipe fencing is completely across the trail to prevent motor vehicle access. Use caution or you could be injured when descending this trail down to Aid Station #1. 5. Streams are running now in most places but not deep. 6. Trabuco Canyon Road from Holy Jim lot downstream to the finish line is muddy and wet in the shaded areas. 7. The parking at Aid Station #2 at the Holy Jim parking lot is small – do not block the fire station. The event may be rescheduled due to rain. If this situation occurs, please call the event Hot Line to be updated on any new event news (714) 894-8211 or check here for posted updates. Our reschedule date is Saturday, March 8th. So far the extended forecast calls for a sunny event day and no rain next week. If you park on Black Star make sure your car is parked well off the pavement to avoid being towed by the Sheriff’s Department. Camping and parking from dusk to dawn is normally not allowed on Black Star Canyon Road but our permit will allow you to park there beginning at 4:00 a.m.
We’ve had problems in the past with participants leaving before the official start time. Support volunteers will be stationed on Black Star Canyon Road starting at 4:30 a.m. to catch anyone attempting to leave early after they check in at the start. You will be DNF’ed if you are caught leaving early. Your number plate must be recorded at all 11 checkpoints or you will not receive a finishing award until the discrepancy is resolved so make sure your number is recorded. 2. The Silverado Trail has a lot of loose rock and two very big washouts and water bars on the last 1/4 mile near the bottom of the trail. Use caution or you could be injured when descending this trail down to Aid Station #1. Please remember on thing; the Vision Quest would not be the Vision Quest if it was easy; if you expect perfect conditions you should not have entered this event. We can guarantee you food and water, but we cannot guarantee that nature and fate will have mercy on you and allow you to finish. This advice should be heeded by participants in the Counting Coup too; a Vision Quest is not about the distance, it is about the experience and your skill. For those just testing the waters of endurance you may find the Counting Coup Event to be your Vision Quest; if that is indeed the case you have our deep respect. Your only salvation is that you are prepared both physically, mentally and spiritually to confront the course, and by default nature herself, on their terms. We had a great turnout at the trail work event on Sunday! We fixed the 6 switchbacks on Holy Jim above the falls that had deteriorated, installing about 15 grade stabilizers and about as many water bars. 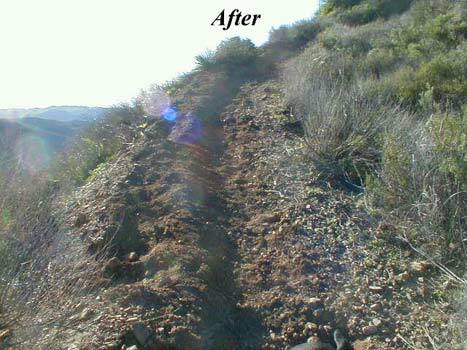 We also worked on two of the switchback turns fixing the rutting on them; the trail looks great! While we were working on the Switchbacks club member Jeroen “Dust Cloud” Bosboom rode up Trabuco and spent about 4 hours trimming areas that were encroaching on the trail. Jeroen then rode to the Peak and down Upper and Lower Holy Jim to get a trail report. We still have the one rut on Upper Holy Jim we’d like to fix before the Pow Wow and we’ll be installing a sign on the Silverado Trail to direct people to the single track that detours them from the “Bomb Craters” installed to prevent access after the fire as well as making a trail through a small section of them. 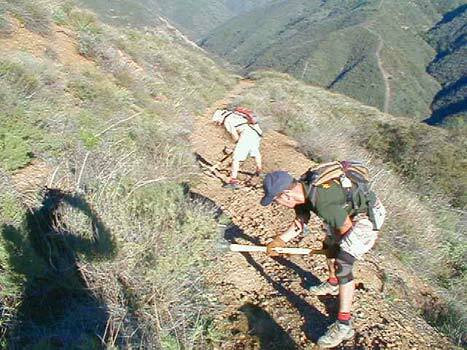 We really got a lot done in our first 3 trail work events of 2007-2008! Thanks to all of you who helped to make them a success! All the roads used for the course are on good condition except for one; Black Star Canyon Road has a big washout. We did construct a 5 foot trail around it but we had it destroyed by Art Tuttle, the individual that lives in Black Star and harasses people using it. We will go back and widen it the morning of the Pow Wow and station one of our CHP Dual Sport volunteers to keep an eye on it and arrest him if he causes any trouble. You can still ride around the washout it no problem; the path is just not wide. The trails are all in good shape; we’ve brushed them and have worked on the trail beds installing grade stabilizers and water bars. We have one rut on Upper Holy Jim that we missed at our trail work event 3 weeks ago but we hope to go up and repair that before the Pow Wow. For those that are unfamiliar with the course the most technical parts are the descent down the back side of Santiago Peak on the Main Divide (because it’s wide open, rocky and you can build up speed quickly), the descent down Upper Holy Jim and the descent down the Trabuco Trail from the Main Divide to the junction with the West Horse Thief Trail. Upper Holy Jim and the Trabuco Trail are very technical trails but if you are cautious you’ll be ok.
We have two guided rides tentatively scheduled for this Saturday and Sunday in the areas affected by the fire closures. Saturday’s ride will be Starting at 8 a.m. be up Black Star, across the Main Divide, down the Silverado Trail and up Maple Springs to the peak. The riders should clear the closed area (Maple Springs Rd to the peak) by 4 p.m.
That gives riders 4 hrs to get to the peak from Maple Springs Rd. There will be cutoff times at the top of Black Star, at Maple Springs and the Silverado Trail and at 4 corners (Maple Spring Road and the Main Divide). Sunday’s ride will be Maple Springs to Holy Jim. The ride will be starting at 8 a.m. and out of the closed area by 12 noon. We will place a 2 hr cutoff to 4 corners (2 p.m.) That leaves 2 hrs ride time if they want to continue to the peak. From the peak south, it is “open” so there should be no problem going down Holy Jim. I will post it so riders will know this requires a shuttle from Live Oak/Trabuco to Silverado/Maple Springs. Each ride will have a maximum of 60 riders participating. You must RSVP to attend and bring ID. You cannot join us if you did not RSVP as we must submit your names to the Forest Service. There will be no substitutions for any rider who makes a reservation. The Forest Service has decided to adopt the same protocol for rides the Nature Conservancy and the Irvine Ranch operates under. Any rider who does not adhere to the rules of the guided rides will be subject to a $5,000 dollar fine and/or up to 3 years in Federal prison for violating the rules governing areas affected by the fire closures. The rides will be posted on SoCal MTB and you have to be a member of the web site – so register in advance. We appreciate District Ranger Keith Fletcher’s trust in allowing us these guided rides and we appreciate the public’s understanding of the need for guided rides to protect the recovery of the areas affected by the devastating fires of last fall. The ride may be cancelled due to weather or postponed if the permit for the rides is delayed. If the ride is delayed due to the permit being delayed those who have RSVP’ed will be carried over to the next scheduled rides. If the links do not activate cut and paste the whole link into your browser. The reservation portion of the links will be activated Thursday, February 14th at 8:00 p.m.